The dangerous effects of workplace boredom should not be underestimated: dissatisfaction with a job; weariness and loss of zest for life; not to mention the economic problems cause by bored employees spending hours surfing the net. Practical and accessible, Boreout! 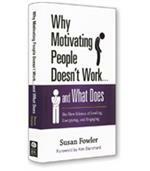 shows employees and employers how to recognize and combat this exhausting condition. With worldwide unemployment rates rising dramatically, it may not be a good time for the employed to admit being bored with their work. At least not within the earshot of those who have just lost their jobs. When practically no job title seems safe from the chopping block, one might beg the question why, after all, a tome about bored workers is needed. Yet, say the authors of Boreout!, the U.S. job market loses $750 billion dollars a year if you factor in hours when bored staff are not doing actual work. That’s a figure that should make at least some CEOs take note. Even the most well-managed companies probably harbor employees who have succumbed to boredom, creating a culture that squanders the potential for growth of individuals as well as the bottom line. While burned-out workers flame out from overwork, bored employees dissolve into useless entities by exercising work-avoidance strategies. They pretend to be working when their bosses hover over them, find clever ways to procrastinate doing their work and conceal the fact that what they have to do takes far less time and effort. The net effect of these strategies creates an unfortunate loop — causing the conscientious workers to get more burned out when they have to deal with unfinished work. To quickly label bored workers as lazy, says Rothlin and Werder, is to gloss over a more complicated situation. In a perfect world, employees would be matched with job responsibilities that harness their talents and sensibilities. All jobs would be endlessly challenging and rewarding. In truth, some of the most stimulating jobs may pay the least. So, in order to put food on the table and a roof over their heads, folks often make big trade-offs, settling for jobs that don’t use their talents or that best fit their family’s overall schedule. Industrialization and specialization have been advantageous for many world economies over the centuries, but at a heavy cost to the worker. Employees are often distanced from the end product or goal of their services because of a hierarchy of work tasks. And the increasing automation of tasks places more and more workers squarely in front of computers, where they do repetitive work all day. So who’s to blame for this growing malaise? 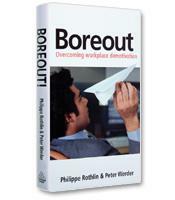 Boreout!’s authors suggest that the responsibility should be shared. Company management needs to get better at identifying the talents of its workers and rewarding those workers with meaningful tasks. Workers need to take a hard look at the trade-offs they make when they accept positions that are not a good match for their temperaments or their interests. And they need to be willing to quit when they can no longer reconcile these trade-offs. 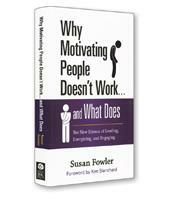 There are many more books devoted to the topic of burnout than to boredom. This being said, boredom in the workplace may be the other elephant in the room that deserves more ink. Boreout! is translated from the German version earlier published under the title, DiagnoseBoreout. While its concepts are sound, the text does read clumsily at times. And some of the authors’ assumptions could benefit from more rigorous analysis. Yet readers who can tolerate a bit of redundant content will find takeaway nuggets, especially in the chapters that mention specific European work scenarios. The truly brave may dare submit themselves to the authors’ litmus test: 10 questions whose answers may gauge the depth of their own job dissatisfaction. At its best and worst, boredom is an equal-opportunity offender. Even folks on the top rung of their career ladders aren’t immune to its cursed effects.